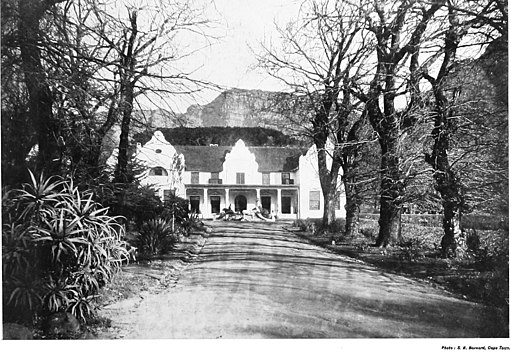 The regal estate that fronts Devil’s Peak next to Table Mountain was home to British colonialist, politician and imperialist Cecil John Rhodes (1853-1902), whose belief in Anglo-Saxon supremacy led him to enact voting and property laws that helped steer South Africa towards apartheid. 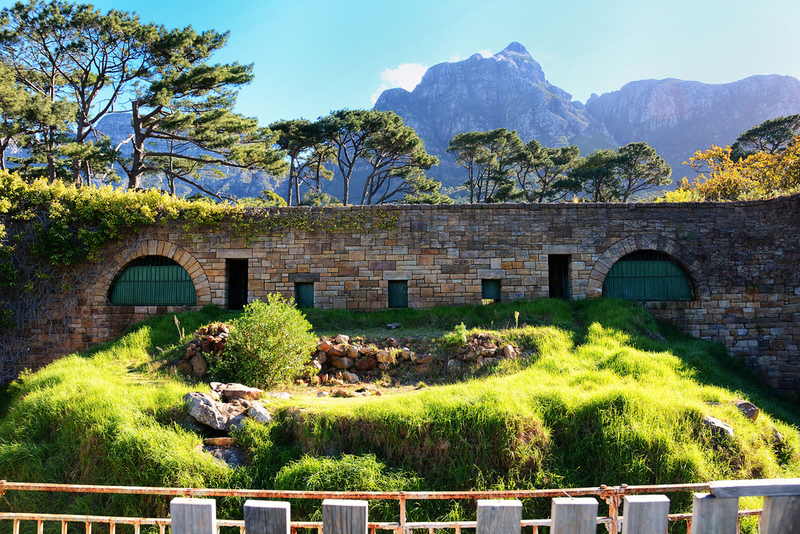 The Groote Schuur, Dutch for “Big Barn,” was first constructed as a Dutch East India Company granary in 1657, and passed into private hands in the 18th century. Rhodes then leased it, purchasing and renovating it in 1893, along with 1500 acres of surrounding mountains and land. 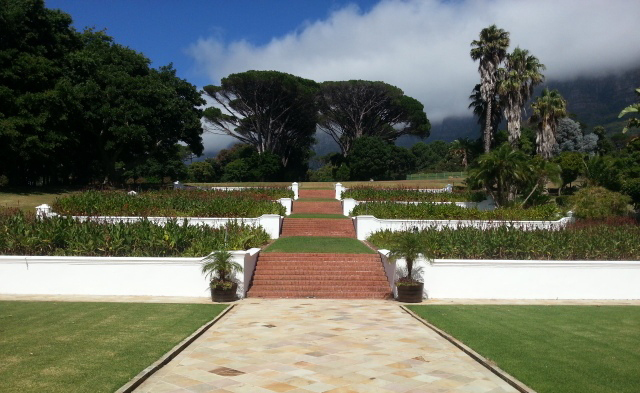 Ever since, the Cape Dutch structure has been an exclusively governmental estate, used to house political officials during their years in office. When Rhodes acquired the Groote Schuur, it was in a dilapidated state. Rhodes had amassed a fortune consolidating diamond concessions through the establishment of De Beers. 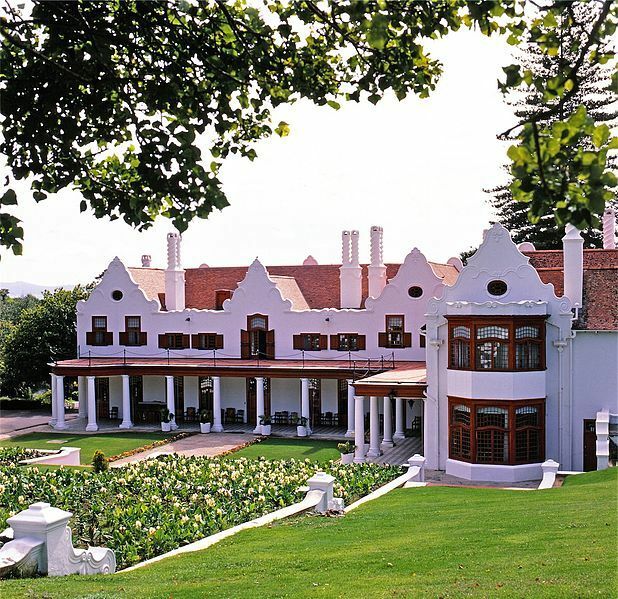 He decided to rejuvenate the property and hired Sit Herbert Baker, an English architect who made many notable government structures in South Africa. The Groote Schuur underwent massive renovation and expansion to revamp its original Cape Dutch appearance while preserving its character. Baker invented a new vernacular, exaggerating some of the curving gables and marrying them to certain English features, such as barley sugar chimneys with their twisted appearance. Although a fire destroyed much of it in 1886, Baker rebuilt it to his first plan, abjuring thatched roofing for tiles. 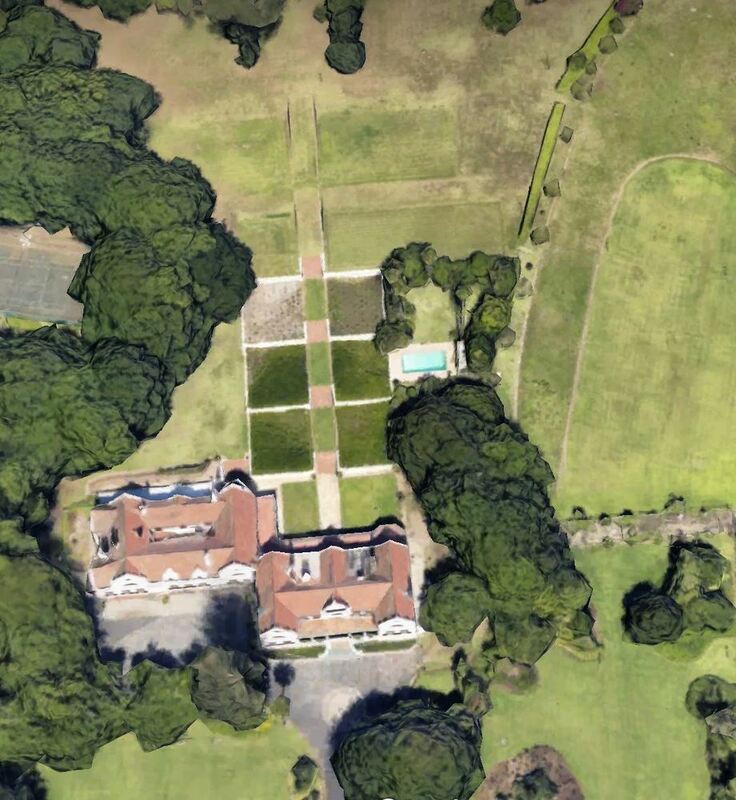 Its enlargement included an entirely new front façade and a large terraced back porch, as well as a new wing that contained a leisure room for billiards, a master bedroom with a great bay window, and a grand hall with a huge fireplace. Its interior also incorporated indigenous yellowwood and stinkwood. The home’s architectural elements are comprised of decorative gables, collonaded verandas, whitewashed walls, and teak woodwork, giving the structure the air of a country estate. A bronze relief by Scottish sculptor John Tweed stands over the front door, framed by Ionic columns. Although it represents Jan van Riebeeck’s arrival and the founding of his colony, it has also been read as Rhodes’s constructed foreshadowing of his own further development as an empire builder, van Riebeeck like John the Baptist to Rhode’s Christ. 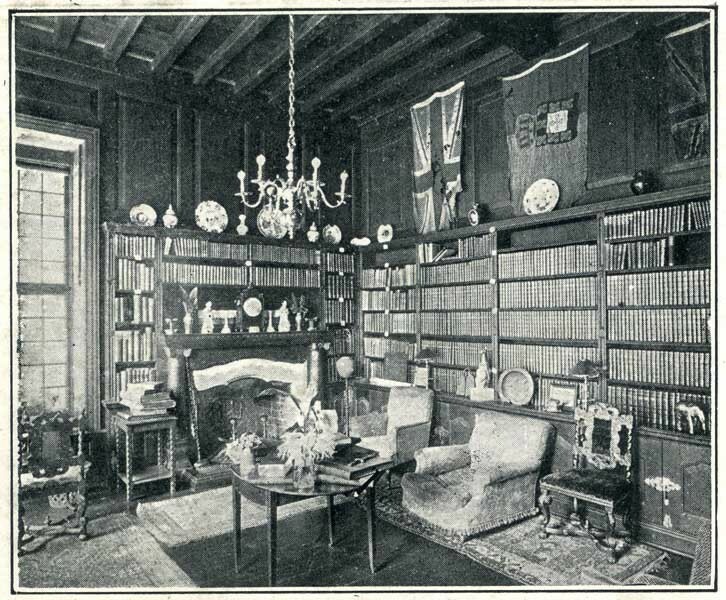 Rhodes also commissioned Baker to furnish the estate, and he filled the house with furniture, books, glassware, and other decorations from the Cape in a shift away from popular London-imported furnishings. 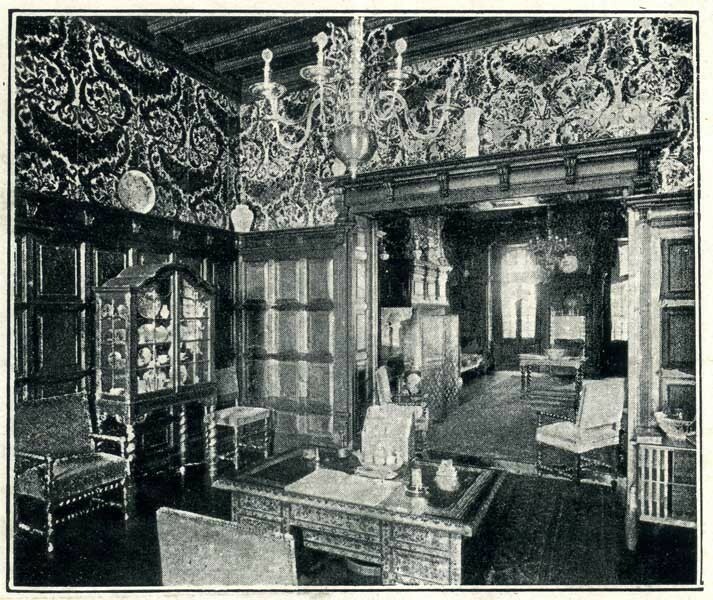 Baker’s skill and interest in the Cape Dutch style inspired Rhodes to collect colonial furnishings and keep African elements a part of his interior decorating. 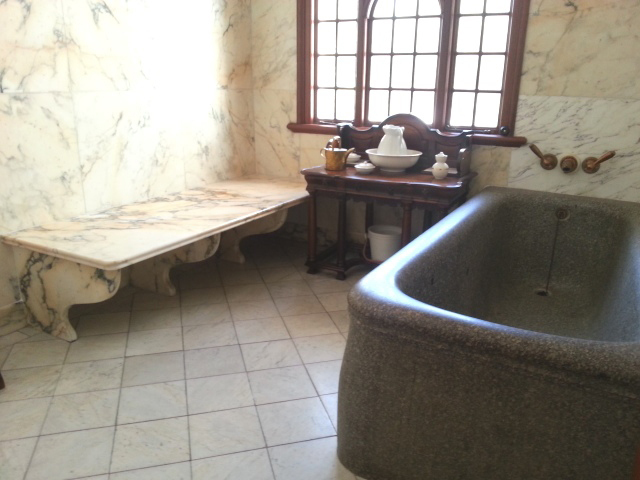 Furnishings include an expertly-crafted Egyptian writing table, an old Cape Town armoire with hidden drawers, an elephant-shaped drinking cup, and an enormous bathtub carved from a single formation of Paarl Mountain granite. The Groote Schuur’s interior remains almost entirely as it was in Rhodes’s day, which means that heads of state through much of the 20th century lived in old-fashioned surroundings that underlined the enshrined past. The narrative was that of a kind of manifest destiny: that what Rhodes considered the “higher races” were fated to rule their inferiors. One of Rhodes' favorite symbols derived from Great Zimbabwe in what was then Rhodesia. Rhodes subscribed to the false narrative of the time—that its mortarless-stone structures had been built by non-Africans who had subjugated much of southern Africa in the distant past. He would have found the concept that the Shona had created the structure, since established by archaeologists, inconceivable. Rhodes had originally wanted to be buried at Great Zimbabwe, but settled for bringing part of it back to Groote Schuur. His bedroom, whose window looked out at the house’s Devil’s Mountain backdrop, still includes a glass front case filled with milk jugs, headrests, soapstone bowls, and other African objects. A stone bird sits at its top; this is one of the eight soapstone birds that stood at Great Zimbabwe, and was snatched by the hunter Willie Posselt, who had separated the bird (about 13 inches high) from its column, which was just under five feet tall. He sold it to Rhodes. A number of similar sculptures were taken from the site, but all have been returned to Zimbabwe except for the Groote Schuur example. The wooden staircase Baker built at the house features comer posts carved in its likeness, and Baker used its form for doorplates and several waterspouts still visibly protruding from the wall under parts of the building’s roofline. Rhodes also had it reproduced and aggrandized for the dome finials at Oxford University's Rhodes House, which Baker also designed, and its replicas stand on the staircase there as well. It acted as his personal emblem and remains incorporated in the Rhodes Trust logo. 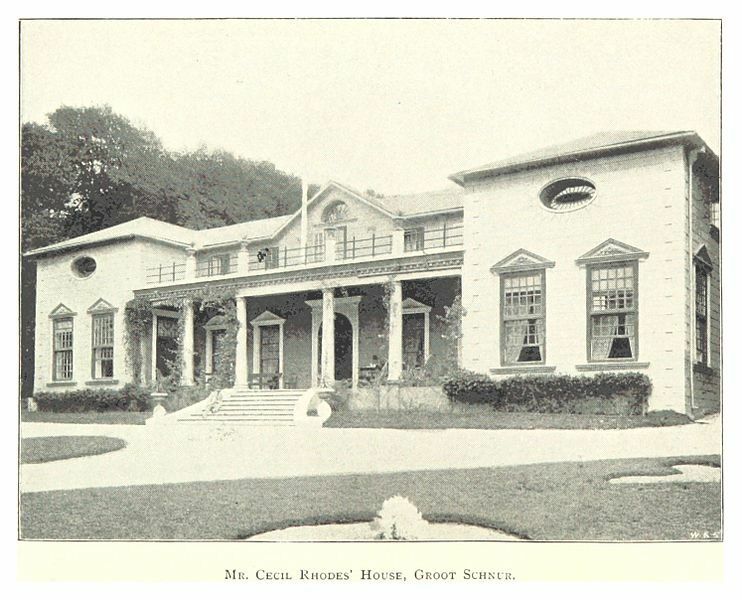 During Rhode’s occupation of the estate, he used it as much as a home as a political headquarters. He frequently opened his gates to the public and allowed them to play and picnic amid the flowers and foliage of the garden and grounds, where he demanded masses of colors. He kept a menagerie closer to the slopes near Devil’s Peak, where visitors were also welcome. 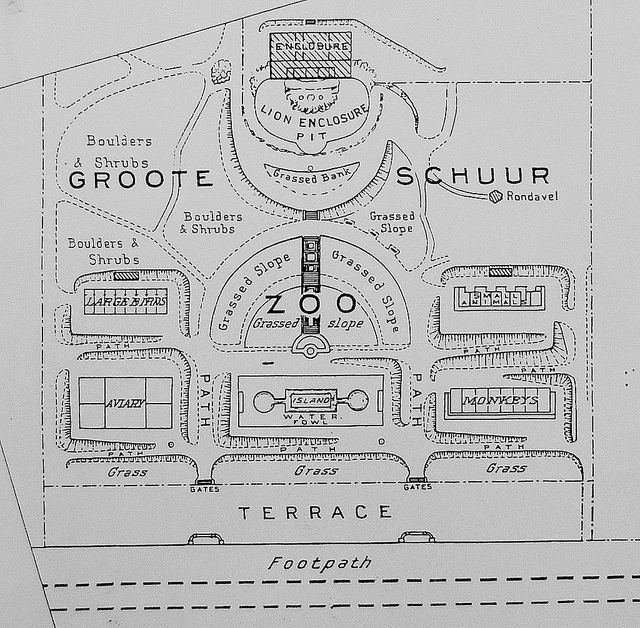 In 1930, decades after Rhodes's death, the Groote Schuur Zoo was constructed, full of antelopes, zebra, wildebeest, and ostriches. It has been vacant since 1975. In choosing the Cape Dutch style and even reverting to the property’s Dutch name, Rhodes gave a nod to the Afrikaaners who had lived in Cape Town before their Great Trek to Natal. 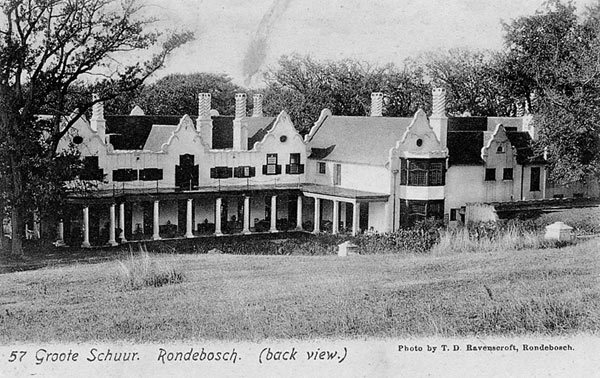 Coetzer suggests that Rhodes’ promotion of Cape Dutch style—at first derided by the English who had taken possession of Cape Town—was the cornerstone of the creation of a fictional common white South African identity, devoid of the very real conflicts that took place between the English and the Boers before their 1910 union. 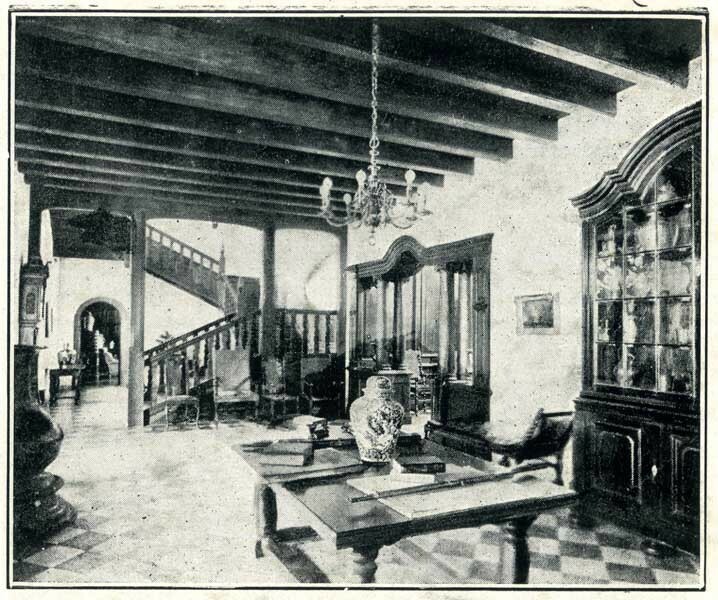 A partner in Baker’s architectural firm wrote an 8-part series on Cape Dutch architecture in 1909, and the would-be architectural joint heritage took on symbolic significance. Cape Dutch Revival became popular in the Cape Town for several decades; first associated with the elite, then the middle class. 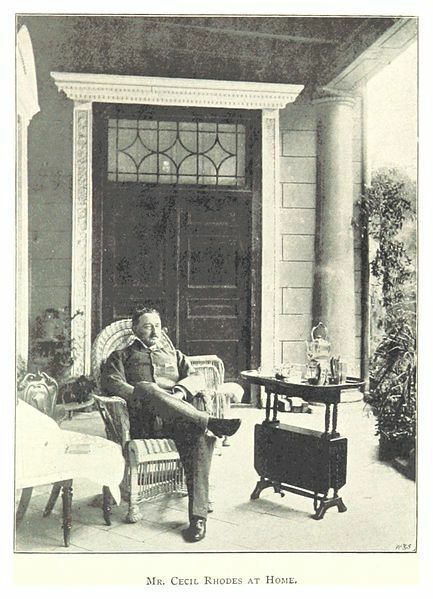 Rhodes left his estate to the nation. 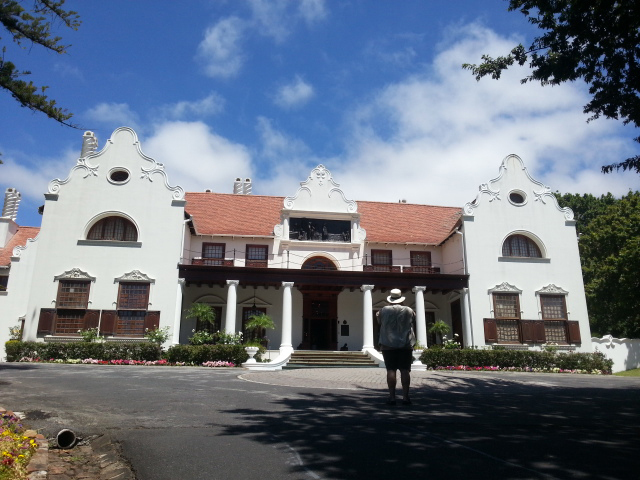 From 1911 to 1994, the Groote Schuur was the official Cape residence to eleven members of the Prime Ministers of South Africa and then functioned as a presidential residence. P. W. Botha, Nelson Mandela, and subsequent heads of state declined to live there. It is now a museum, known as Rhodes Memorial, but is only open to the public by appointment, unless public charity events are scheduled. 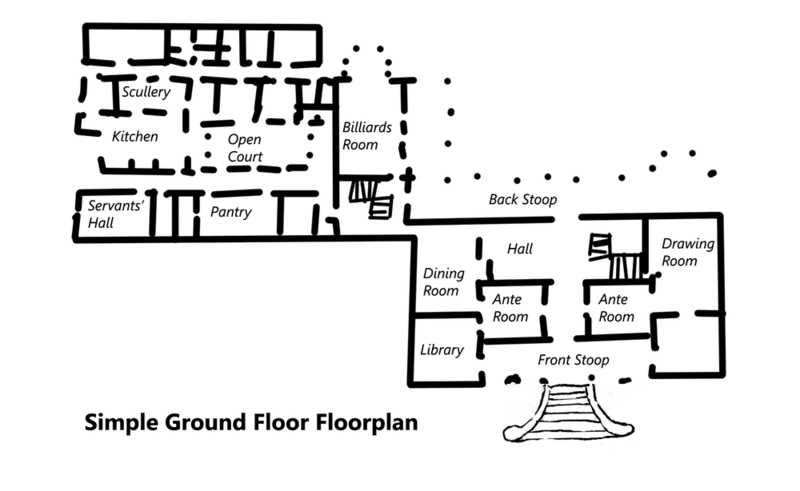 Simplified Plan of Ground Floor, Groote Schuur: With the exception of the Billiards Room, the service section of the ground floor is the same size as the living quarters. 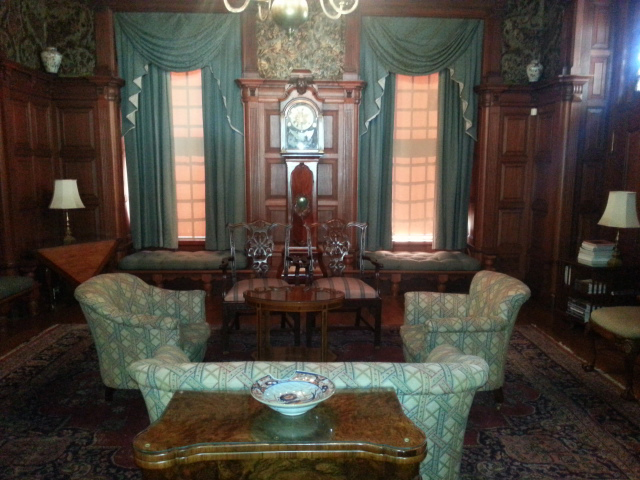 Rhodes' bedroom was directly above the Billiards Room. ~ Source: Baker, Herbert (Sir). Rhodes, C.J. Rondebosch, Cape Town. Details. Plans. Elevations. Groote Schuur. WIReDSpace (Wits Institutional Repository on DSpace) ~ Creator: After a plan by Herbert Baker. 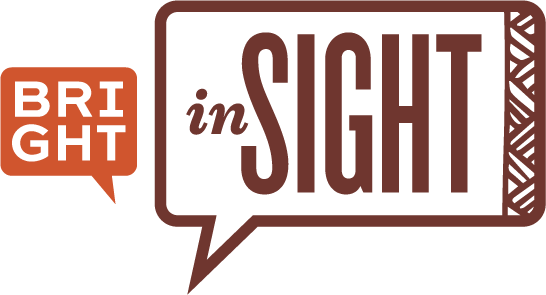 Emma Fischer, Cleveland State University (edited), “The Groote Schuur,” Bright Continent, accessed April 20, 2019, https://access.thebrightcontinent.org/items/show/29. Coetzer, Nicholas. Building Apartheid: On Architecture and Order in Imperial Cape Town. London: Ashgate Publishing, 2013. Coetzer, Nicholas Robert. "Representing and Restructuring Identity and Architecture, Cape Town, 1892-1936." Ph.D. dissertation, University College, London, 2003. Cumberland, Stuart C. What I Think of South Africa: Its People and Its Politics. Hamburg: Books on Demand, 1901. Duncan, Paul, and Alain Proust. Hidden Cape Town. Cape Town: Struik Lifestyle, 2013. Hensman, Howard. Cecil Rhodes: A Study of a Career. London: Blackwood and Sons, 1901. Maylam, Paul. The Cult of Rhodes: Remembering an Imperialist in Africa. Claremont, South Africa: David Philip, 2005. Radford, Dennis J. "The Architecture of Herbert Baker's Mining Housing." South African Journal of Art and Architectural History 3 (30, 1990): 257-267. Williams, Basil. Cecil Rhodes. New York: Henry Holt & Co., 1921. Published on Dec 29, 2017. Last updated on May 25, 2018.